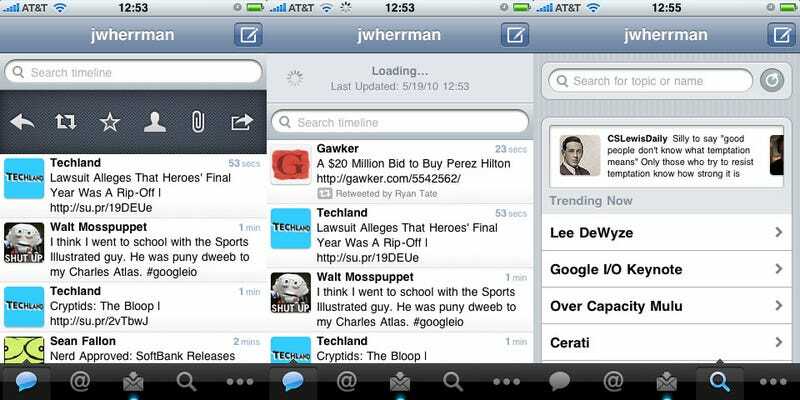 When Twitter swallowed Tweetie maker Atebits, they declared that an official Twitter client—a la Android's—was on its way. You'll be happy to hear that Twitter has barely changed the iPhone's best Twitter app, except where it counts: Price. The app is currently showing up for Tweetie users as an update, but should be available here any second. It's very familiar: Aside from a new icon and start screen, this is Tweetie 2. The only functional change I've noticed is the new search screen, which includes a trending topics rundown—some of which can be accessed even if you're not logged into a Twitter account. (The idea being that you can glean news from Twitter the second you download the app, and continue to do so without a user account. Twitter lurking, I'll call it.) Other than that, all of Tweetie's best features are here, including the should-be-standard-on-everything pull-down refresh, Tweet swiping (for options like reply and retweet), and the super-clean interface. Also present are a few of its annoying quirks, one of which causes every direct message you've ever received to appear as unread. Also, the app doesn't include push notifications—you'll have to use an app like Boxcar for that.